Yinney looked around at the small group gathered at his 7th Day Tree. The macaws were doing a wonderful job of spreading the word about the Fellowship. Not only were the three macaws here, but also some howler monkeys from the rubber trees! Bubba the Buddhist had sent them to listen and learn, and then return to him and share, so he could consider and compare. Another wonderful surprise was Cappy the capybarra! He was visiting for the first time and sat patiently on the ground looking up and listening. Yinney had moved lower in the tree for the sake of Cappy, and looked forward to talking more with him after the meeting. It had been a couple days, but so far Tornado Turtle had not come around. Probably distracted by some glittering treasure somewhere, but he still hoped he would see her soon. “Does the thought of perfection scare you? A mark so high? A standard so impossible? Yes, impossible for us, but not God. So do not be afraid, just know that God from the beginning said he was taking us to perfection, that is our promised land. This is no new thing, and we have all eternity in Christ to reach it. The ability to fellowship without eating each other is part of our training in the perfecting. The early church knew this, and the early church fathers taught and practiced it,” he concluded with a smile, and then began the discussions. Church was just getting started. Frank now understood he would no longer be a New York City cop. The damage to his spinal cord gave him about a fifty-fifty chance of being confined to a wheelchair. No one knew if he would walk again, but therapy was beginning soon. He was now officially retired from the force, and feeling lost. “What now?” he questioned. He really hoped he would at least walk again. He had only been conscious a couple days. His partner, Sam, promised to help him anyway he could. Sam was a great guy. Their friendship would continue. His sons were there for him too, and Rachel and her daughter, Clara. As a matter of fact, he thought he noticed his youngest son, Tommy, and Clara having a lot of private conversations over the past two days. What was that about, he wondered? But Tommy would be leaving soon to go back to his job, working on that road in the Amazon. More than anything, he wondered about Rachel. Their relationship had began while he was strong, healthy, and still a cop. Would she want to marry a cripple? A man most likely too damaged to even carry her across the threshold? If he had any chance with her before, which he still did not know, did he have even less chance now? Was she constantly visiting him out of sympathy, and would eventually slowly fade out of his life as soon as she was sure he was going to be okay? All these questions and more rolled around in his mind as he lay in the hospital bed with so many hours to ponder every little fear and negative thought. The view out his window was an ugly concrete wall only an alley away, with clouds and drizzle decorating. A new life lay ahead. The details and potential of that life he did not know. It certainly still had lots of possibilities, especially if Rachel was part of it. He hoped she was, even more than he hoped he walked again, and he really wanted to walk. Fight hard he would. Both to walk, and win Rachel’s love. Filling his lungs as full as he could, he lowered his head and entered the deep. The sunken log lay straight ahead. He saw brightly colored little fish swimming about, and perhaps a poisonous frog or two as he plunged. There were many bright colored creatures in the Amazon, but he was not one of them, the better to blend in. The log was heavy with weeds, soft with rot, and half sunk into the silt floor of the lagoon as Yinney latched hold with his great back claws. Now that he was anchored, he could fully focus on the beauty of his underwater sanctuary. Looking upward, the sunlight lit the waters, slowly dimming as it filtered down. The world around him was cast in a greenish hew, yet he could see clearly. It was wonderful! His heart wanted to race with the excitement of achieving what had been a long-time goal. This was it! He was deep in a lagoon and preparing to meditate. He was at the bottom with a single breath of air sustaining him. His heart beat slower and slower as he focused. Yinney did not know how long he could hold his breath, but it was a long time. There has always been something about water that is spiritual. Even the sound of rippling water is instantly soothing to the soul. And the sound of being underwater is a world of its own. He was sure this secluded and quiet environment could take him to a place he had not yet known, deep in his soul. And so it began… his back claws hooked into the half rotting log… the air in his lungs gently lifting him upward like a hot air balloon, it was as if he were suspended between two dimensions. It was a floating, and his heart beat slower and slower until finally Yinney was entering more spirit than flesh, a place where the voice of God can speak more clearly, if God decides to. But whether God spoke or not, he always felt his Presence, and the Presence was enough. Several minutes passed by as he floated. His eyes were open. He felt no need to close them. He was not sure if he was even blinking? He floated in peace, love, and patience. It was complete satisfaction. His 7th Day Tree was waiting for him above, and what more did he need than his tree, this water, and the Presence of God? “A man?” The response flashed in Yinney’s mind before he could stop. He did not want to miss a word of what he was hearing, but this was beyond anything he had experienced before, and the voice spoke of a man? Quickly refocusing, he hoped he had not missed anything important, but it was all important! Silence followed. Yinney was in a daze and hung there as long as he could in the greenish hew without moving. The need for air was growing stronger, but he did not want to leave. “Might there be more?” he waited, and he repeated what had been said over and over so as not to forget a single word! And when nothing more came, with his lungs screaming he finally released. His body immediately began rising, and with two great strokes of his long arms, his head broke water as he sucked a long and very deep breath! “What was that?” he asked himself. But there was no denying what it was. He stared at his tree standing humble on the bank. There was nothing to distinguish it as special in any way. But the voice had said they would come. “And a man! How can this be?” he questioned. If his strokes had been slow before, they were even slower now, because he was still in the grasp of the meditative state and the vision it had revealed. He would spend days pondering these words and what it meant. He would write them down in his book, and read them over and over, but he must not only read the words, he must do! The Teepee has come so far from this place, as you shall see, but let’s talk more about our personal God Task, one very important part of our Formula. This Teepee has been a God Task to me, and not a small one at that. That’s a very large tree you see through the Teepee frame, and I have built this by myself. I had help only one day, when raising the first three legs. The Formula is meant to bring “Balance” to our living, so we can enjoy peace, simplicity, depth, things of true value, and not be the slave of this world’s rat race. Let the rats run the race, not those who believe in a higher way. What do you want your life to teach? Do we speak of a higher way, but run with the rats? What kind of teaching is that? You do realize we’re all teaching someone, right? That’s the next part of “The Formula”, that Inner Circle of Influence. How can we find OUR God Task? And what does it say of us? What does it preach? How can we be certain of what it is? And how does finding that bring peace to my life, rather than just more chaos, guilt, and stress? Well… for one thing… your God Task COMPLETES you. Without it you’re not satisfied inside, and that dissatisfaction causes you to chase MANY things instead of being able to FOCUS on the FEW things that truly give MEANING to who God created you to be. Chasing these MANY things that do not satisfy is the reason you’re so unbalanced, stressed, and near exhaustion. Not to mention how much this is likely ageing you. It’s a very unhealthy lifestyle. But many people care more about what others think of them, than their own health, or even what God thinks. (Sad to say, but true.) As a result, their life ends up teaching what the world pressures them to teach, and not what they really wish they could. Trust me, you don’t want to find yourself at the end of your life having pleased the world, but never found yourself. Your “God creation – God design”, is a DNA you cannot get away from. You will never feel completed as long as you ignore who you were designed to be, your God design. Therefore, your God Task is connected to who you really are, and the things of this world, ARE NOT. So don’t be fooled any longer. It is the truth that sets us free. God truth. The Teepee came to me as I left the modern American Church, because I was finally convinced it wasn’t me who was messed up, but it was up to me to finally pursue what I believe to be scripturally true, in spite of what the so-called experts may be saying. I was hungry for more of God, but didn’t know where to go. My experience has been, that if you truly desire God, you will begin to get the vision for your life. In a very short time, God began revealing to me, that I had a place I could begin to develop into something special he had in mind, and my heart began seeing a large Teepee, of all things. God had been setting me up for this for a while. My wife and I got interested in “Tiny Houses”, but after some study of the situation, decided it was not for us. Still, a certain seed, a certain interest had been planted. And then there was a desire to connect more to my Grandkids. But how? Admittedly, there are many ways to connect, but we had this “place”, and what was I supposed to do with it? One thing kept leading to another. Then came the idea of Grandpa White Feather. I was hungry for more of God, and God was leading me to a divine task. I talked to my parents about building the Teepee behind the barn. They thought it was a great idea. This was a green light, and I started the huge project with great interest and delight. A few months after I started building, someone spoke to me about early retirement, and I felt led to do so. One day at a time I have been on the journey of “one” of my God Task, for no life is simply one thing, but we must control how many things. I started this blog so I could share this journey and preach this message in a different way. God put the writer/teacher design in me. It has been a natural flow. I love it. But let me show you a few newer pictures of the Teepee. It’s still a work in progress, and every month brings considerable changes. I’m about to go multi-colored with outside of Teepee, but hasn’t quite happened yet. There are now three windows in the Teepee. You can also see air vents I added at bottom. That tarp flap at the top can be opened and closed by ropes I ran up and over tree limbs. But let’s go inside. When I first started the Teepee, I wasn’t sure how God was going to use this. It’s not in a big city. It’s isolated. I couldn’t help but wonder if I was putting a lot of time and effort into something that would only have very small impact? 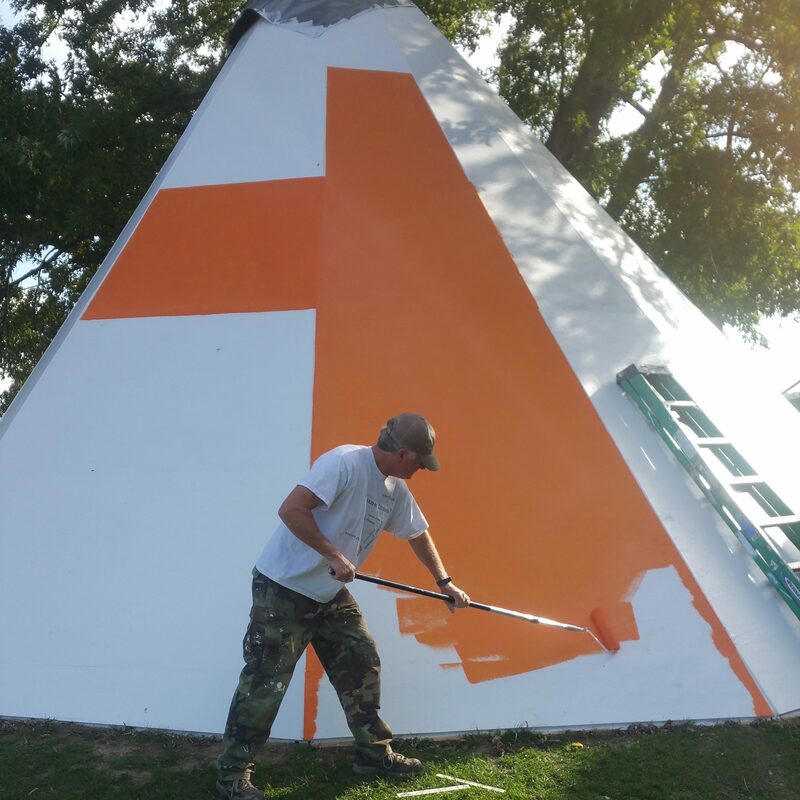 However, I have been amazed at the people who have been touched and affected by this Teepee, not to mention people reading this blog site, of which I have no way to know, in most cases, who really reads and who does not? You can sort of tell, and there are a few of you who really read. I thank you so much, and I hope this helps you find a path of simplicity and depth in Christ as well. Here is a workbench I just installed, in which I hope to use wood to create works that teach our message. Like wood plaques and so on. In next article we look at the “Inner Circle” of the Formula. Jesus had his Inner Circle. He had the 70, the 12, and the 3. We all have an Inner Circle of Influence, but what are we doing with it? Does it bring value, meaning, purpose, and balance to our life? Or have we not really developed our Inner Circle in a way like Jesus DID? WDJD. This too, can bring balance or chaos to our daily living. Let us truly follow Christ. Again, begin to hunger after God if you do not know who and what he created you to be and do. You will only be half a person without knowledge of your God Task, and you will chase many things trying to satisfy that hunger, only to no avail. And you will teach that same sad life to others as well. The “Herd Mentality” is a path well trodden by the masses. It takes a truly wise person to leave the herd, and hear the voice of God.